I wished for snow, and it came, although not the right kind of snow. It began promisingly, fine and dusty, but rapidly transformed itself into fat, soggy clumps and then plonky rain. Nothing settled. Hey ho. Now that the garden is no longer full of defunct kitchen appliances and builders’ debris I am able to scour my terracotta pots for signs of life. 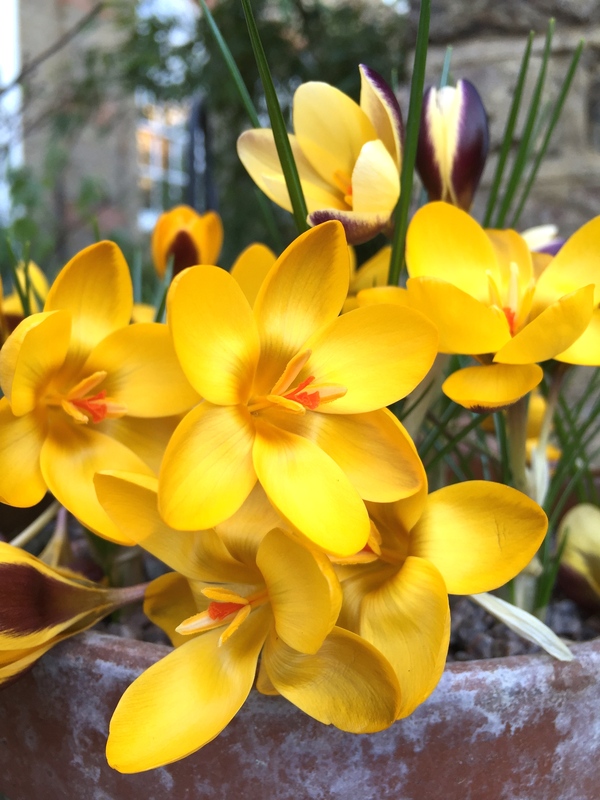 The first bulb to emerge from its winter slumber is Crocus chrysanthus ‘Herald’, a dramatically bi-coloured crocus with buds striped aubergine and gold, like a wasp. They fade a little to primrose and purple as they open (which requires sunshine), but are still joyous to behold as they leap like little flames from the ground. The tiny blooms of C. ‘Herald’ truly are harbingers of spring and aptly named. Every year a handful of my spring bulbs remain unplanted, and I regret now that the half of these cheery crocuses remain sequestered in a paper bag somewhere. 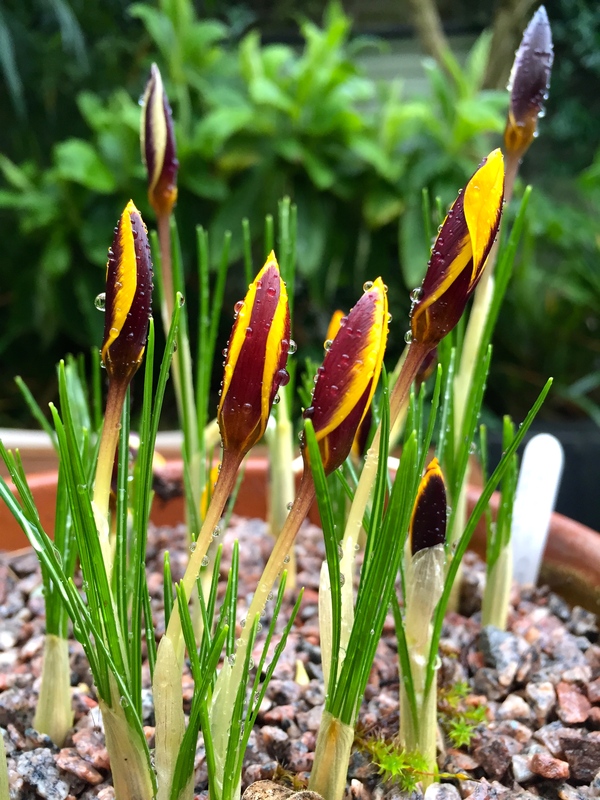 The next bulb to bloom will be Iris reticulata ‘Spot On’, which is a new hybrid developed by Canadian breeder Alan McMurtie. It promises extravagantly purple-splashed, white falls. I hope it might be in bloom by next weekend. Also up and about is Tropaeolum tricolor, which has already scrambled well above the top of the sticks I put in to support its twining shoots. The snow has already passed and the sun is making vain attempts to come out. If it does, I might get a fleeting glimpse of C. ‘Herald”s petals opening broadly to embrace the welcome warmth. Stunning! You will have to provide an update when it blooms, but with these fab buds, who cares if ‘Herald’ unfurls?! Definitely one for the “The List”, like this one very much! I started my summer bulb order last night. It was looking dangerously indulgent so decided to put the pen down and come back to it in a more sober mood! Good idea, I call it Kid in Candy Shop Syndrome! I really love your leaping from the ground like flames description…..very good!! Such a welcome little burst of spring! And I’m looking forward to seeing the Iris in bloom, they sound just perfect! I hope so Amy. We have a chilly week in store so it may hold the flowers back a little. Well, I have never seen crocuses like that before. Please can you post another picture when they open?